The German 10-yr yield and hawkish inflation comments by Draghi supported EUR against USD. The support rests at 1.17030 with resistance at 1.17810 which the weekly pivot point at 1.17240 is located in between the lines. The EMA of 10 is moving with bearish bias in the ascendant channel and it is above the EMA of 200 and the EMA of 100. The RSI is rising towards the 50 level, the Stochastic is moving in low ranges and the MACD line is below the signal line in the negative territory. The ADX is showing buy signal. 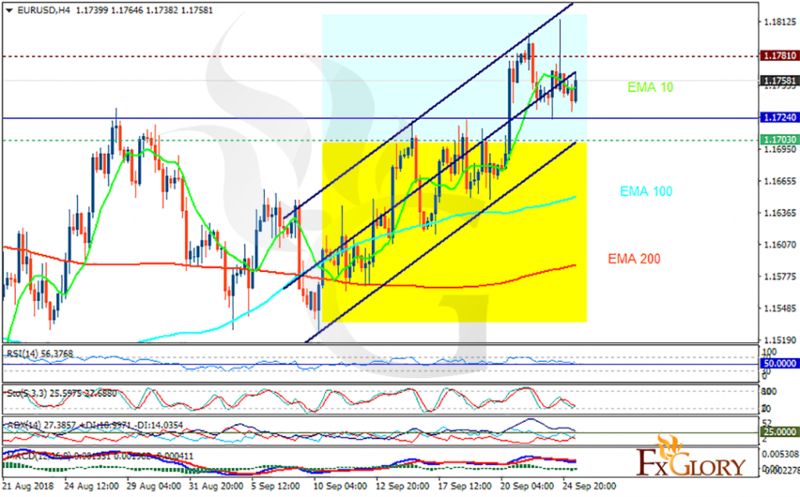 EURUSD might continue its bullish trend towards 1.179.